Have you ever thought about making your own skincare? I was recently invited to Be Fraiche's lotion and cream workshop. 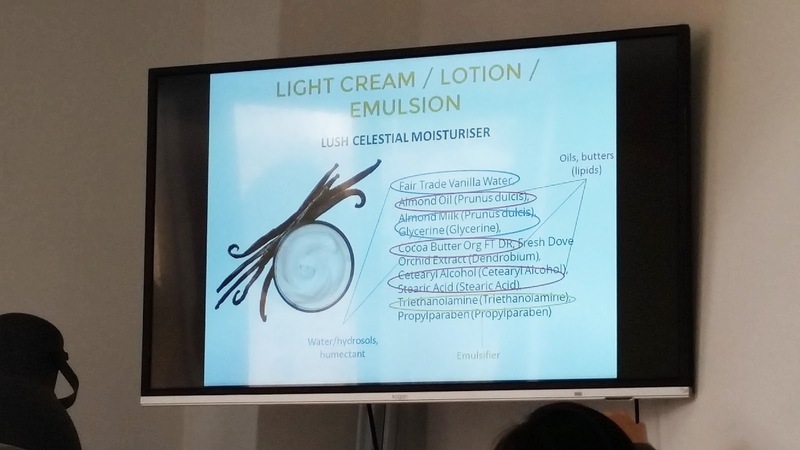 This workshop is created and ran by lovely Helen, she has a background in Organic Skincare Formulation and perfumery. You are learning from an expert! Making skincare is relatively simple, however you will require a few pieces of equipment and crucial items such a oils, essential oil, shea butter, scale and natural preservatives etc. 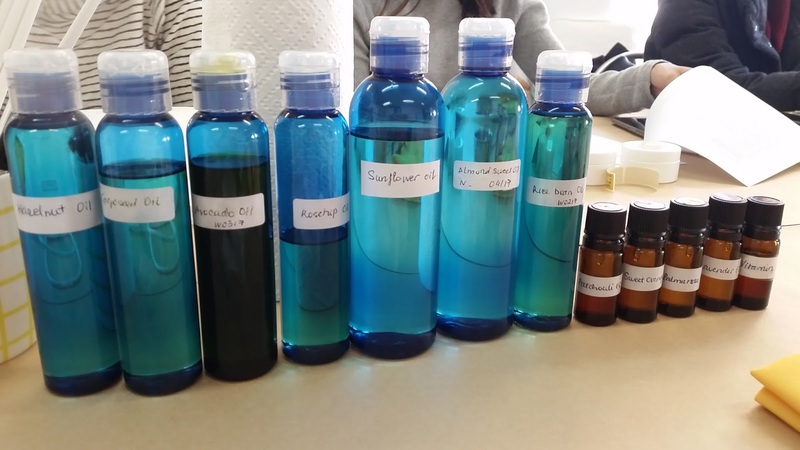 I don't know a lot about the science behind skincare, so I learned a LOT from Helen! The workshop started with self introductions and we learned a little about Helen. She went through a few slides and explained different ingredients in skincare. This was FASCINATING! Unless the ingredients are put in layman's term in brackets, I usually don't have a clue what it is or it's role in my skincare (See picture below). We each received a handy little booklet which provided fantastic information about an array of different ingredients, what they are good for and the formula to make rich cream and lotion. This booklet was put together by Helen! Emulsifier contains water and oil parts. Propylparaben is a synthetic preservative. Essential oils are made from distilled plants, only a small amount of essential oil is produced through the plants while the rest is fragrant water that can be used in making Turkish delight etc. Patchouli oil is great for anti ageing. Companies are able to patent perfume, hence hide their "secret ingredients" within the perfume so it does not need to be disclosed. Preservatives are only required when making water based skincare products. It is not required in oil based products, however Vitamin E is necessary to prevent the oils from going rancid. Children under 6 years old should not be in contact with essential oils as they may develop allergies. Before we started making our own skincare, Helen demonstrated each step to guide us. All tools and equipment were provided at the workshop. We each made our own oil based rich cream mine had mango butter, grapeseed oil, sweet almond oil, vitamin E and sweet orange essential oil for the scent. To make the Emulsion, we got into groups - my skin is forever changing. It was combination for most of this month and now it's dry and chapped by wind burn. The Emulsion was a little bit difficult to make, the combination of the oil and water was tricky but with Helen's guidance and having a pro mixer in our group we made the perfect lotion! We used a naturally derived preservative so it will last for approximately 6 months. It felt so good to be able to make my own lotion and oil based cream - the accomplishment was real! Not to mention we were also treated with snacks and Nudie orange juice half way through the workshop, nom nom nom. Once our cream/lotion is ready, we poured our little achievement into empty containers provided at the workshop. We also received a sample of Helen's Bean Scrub!! I highly recommend this for those who love DIY, into natural skincare and want to know what goes into their skincare. This workshop is also perfect if you like to customise the texture and scent of your creams. If you are sick of paying a ridiculous amount of money for skincare and looking for natural alternative, check out Helen's workshops! *Lily not Louise was invited to this workshop as a guest, thanks to Helen from Be Fraiche. I am sure I have told this story previously... but since this is an Antipodes brand focus, I think I need to tell the story again! During early uni days I spent my weekends working for a cosmetic brand at Myer. My friend worked for Jurlique, she told me she saw a man stocking a small section of Myer's corner shelf with this new product from New Zealand called Antipodes. I couldn't help myself but to check out the products and instantly fell in love. That was when I first discovered and started trying Antipodes. That was approximately 5-6 years ago. Antipodes is one of those brands that you can't not love! They believe in sustainable cultivation of local plants from New Zealand (i.e., kiwi seed) and their packaging features fully recyclable bottles, aluminium tubes and is 100% biodegradable. A part from food and beauty products, the environment is very important to me. Yes! I am a bit of a greenie and I will always stand behind brands who cares for the environment. This is a beautiful butter cleanser that can be used on a daily basis for a deep clean. Unlike the foam or cream cleansers, this will rid every trace of grime from your face. I like to apply a scoop of this on damp face followed by a gentle massage. There are small granules (not microbeads!) for gentle exfoliation. The method of use is fairly similar to Trilogy's cleansing balm, you will need a facial cloth to wash the butter off your face. I found cotton cloths to work the best. Although this cleanser is recommended for daily use, I have been using it at least twice per week, some nights I really don't feel like washing my facial cloth, I just want my make up to come off and face plant on my bed after work. When I use this butter cleanser I find my pores to be cleaner as opposed to when I just use cream cleansers for the entire week. This is a beautiful alcohol free toner mist, the pump it easy to push and the spray disperse evenly. I can definitely smell the sweet sage in this toner, if you don't like sweet scents, watch your nose! I have been using this toner every night after shower, and some morning if I have time before I run out the door. It provides immediate hydration to my face after a wash.
Oh and this is the toner I have been using to dampen my skin before applying my Rosehip Oil. It makes my oil so much more easier to spread! It is also important to mention that a natural preservative is used in this toner to extend the product's shelf life to up to 6 months. In fact the recommended shelf life for most Antipodes products is 6 months - all because they use natural ingredients without synthetic preservatives. Don't get turned off by the colour of the serum, it's brown, goes on translucent and smells absolutely divine!!!! Imagine fruits in a bottle. Antipodes' packaging doesn't disappoint, this serum (in fact, most of their bottled products) comes in a glass bottle. I picked this serum because for it's antioxidant properties - and I really need that! Personally, I feel this serum is perfect for those with really oily skin because (correct me if I'm wrong) but it's a water based serum. The serum itself is non-greasy, non-sticky and does not leave any residual on the surface of your skin. The content sinks into your skin almost instantly! Unfortunately, for me, this does not provide enough moisture - BUT since it's a water based serum, it is the perfect serum to use under oils. A beautiful silky eye cream to re-hydrate and recharge the under eye area. I would highly recommend this eye cream for those who are fighting fine under eye lines or looking to prevent under eye wrinkles and crows feet. When I was 20 I tried using mum's rich and nutrient fill eye cream, I quickly discovered it wasn't suitable for my skin due to the growth of under eye milia. So if you are in your early 20s, I would either recommend a gel eye cream or alternate between Antipodes eye cream and a gel based cream. However, I suppose it all comes down to your skin concerns. Personally for me, this eye cream has worked well. The cream itself is easily absorbed whilst still providing moisture and does not sit on the surface of my skin. My eye bags are still visible - I've accepted he fact that those bags are genetic and often stress related and I am very stressed due to work. This eye cream kept my fine lines at bay and maintained the condition of my under eye area - almost fine line free! I do have a liking for hand and body creams stored in aluminium tubes, and I can't explain why. This is a beautiful hand and body cream with pure avocado oil, wild blackcurrant berry and hibiscus bloom. The consistency of the cream is thick, however non-greasy and absorbs quite quickly following application. My skin felt soft, smooth with a lingering pleasant blackcurrant and hibiscus fragrance. The blackcurrant scent is very prominent alongside subtle notes of hibiscus bloom - I can't stop smelling my hands!! This is a must have for winter or those with dry hands and love fruity scents! *All products in this post were provided for editorial purposes, all opinions are my own. My younger self often made the mistake of skipping sunscreen during winter thinking the sun cannot get to me through all these clouds. Unfortunately our skin becomes more sensitive during winter while the UVA (the ageing) rays does not get weaker, instead covers every spot the sun reaches. UVA rays can also penetrate through fabric and glass, so make sure you are sun protected from top to toe! The larger parts of our body are often covered in thick layers of clothing during winter, however we need to consider and avoid neglecting other important body parts (i.e., face, neck, lips and hands) that is often exposed to the sun and damaging rays. Today I want to share with you 4 sunscreens to keep you protected this winter. I am not sure if it's a coincidence but all products can be purchased from Chemist Warehouse! Let me introduce two of my favourite sunscreens that I have been wearing for the past 4 or so months, Sunsense Moisturising Face SPF 50+ ($11.69 from Chemist Warehouse) and Cancer Council Face Day Wear Sunscreen SPF 30 ($12.99 from Chemist Warehouse). Both are high quality products, very moisturising, excellent for winter and those with dry skin or combination skin. I stand firmly behind Ego Sunsense when it comes to sunscreens, their products just suit my skin. Sunsense Moisturising Face is a lotion, so the formula is a little bit runny, however very easy to apply, it's non-greasy and doesn't feel heavy. The formula absorbed almost much instantly following application and dries more or less matte. I feel that this product may suit those with oily skin during winter as well. If you are interested to learn more about the different products from Sunsense, click here. For those who experience flakey and chapped skin during winter like I do, the Cancer Council Sunscreen is for you. This is actually the first time I have tried any sunscreen from Cancer Council, we use to purchase random sunscreen from Coles and Woolworth and they all left my face super duper greasy and oily. If this product wasn't sent to me, I would have dismissed it in the shopping isle and it would have been a huge mistake!! I go through stages of winter where my face goes from combination to ridiculously dry and flakey to the point I need to lather Vaseline all over my face. Cancer Council Face Day Wear Sunscreen possess a very creamy texture that goes an extra mile for my flaky skin while still manage to be non-greasy and light weight. Remember not to neglect your neck! Lip cancer happens more frequently than we expect during winter, we need to protect and moisturise our lips. Sunsense SPF 50+ Lip Balm ($4.99 from Chemist Warehouse) is my all time favourite SPF balm because the formula is extremely moisturising, excellent for chapped lips and have a high SPF rate of 50. Sunsense Lip Balm does not dry or chap my lips over time like some of the other lip balms. I always have a tube in my bag and it's my ultimate travel lippie. This product is also 4 hours water resistant. I have written an in depth post about this particular lip balm here. Sunscreen for hands, why is this not more widespread?! I keen two tubes of hand cream in my bag, QV Hand Cream SPF 15 ($4.99 from Chemist Warehouse) and a non-SPF hand cream for when I am indoors for the day. I'm no scientist or chemist, but my dad told me to put moisture on my legs to tan faster. So... if we are out in the sun and used creams without SPF on our hands (especially if it has petroleum) does that mean it's encouraging the process of ageing? I have no idea, but logic is telling me to use hand creams with SPF while I am outdoors. I had a look at my hand cream stash and QV is the only hand cream I own with SPF. Good on your QV! Now I want you to assess your stash and find a hand cream with SPF, if you don't have one, you might want to consider investing in one! *All products mentioned in this post were provided for editorial purpose, opinions are my own. I was honoured to be able to celebrate the launch of Benefit's 9 spanking new products recently! The party was held at Crystal Bar, Martin Place. We were greeted by Benebabes with bunny ears and magical wands! I have never attended an event where I felt so welcome and at home, everyone from Benefit spoke to me as if we were old friends, it made menall warm and fuzzy, I felt so loved and comfortable (hence had the best night)! There were so many different unique elements to the event, however the ultimate theme of the evening is "Magic" as our brows are magically transformed with Benefit's new brow products. The magic was definitely there, from a GIF booth, contortionist to face readers and a heck of a magic show following by the product showcase. This is the first time I have ever witnessed someone walking on champagne bottles, in platform shoes, WHILST holding/drinking a glass of champagne poured from the bottle (which were all empty by the way). I also spotted Wengie and decided to get happy snap with her below! We waited in line for the face reader but never quite got there. The magic show happened and the products were revealed. We were excited to the point we hopped out of line to have a play with the products. I have ever been much of a brow person.... until now. One of the Bene-Babes applied some Gimme Brow on me and I was SOLD. My brows looked natural and full, I didn't look angry at all! Now I can see why and how Gimme Brow is such a must have among my friends and colleagues. Ladies, get your brows ready for this jelly!!! Mark your calendar and save the date, all 9 products to hit the stores on 22 July! *Lily not Louise attended this event as a guest of Benefit Cosmetics Australia, A MASSIVE thanks for having me! Love love love, endless love! The first week of July is over! I have been ridiculously sick for the past week and the sickness is finally making it's way out of my body, slowly but surely. I blame all the people coughing and sneezing on me on the train. Today I have a sponsored post for you guys, even though it's in the disclaimer, I want to make it clear in the intro that I will always write my reviews the same regardless of sponsorships. Trust and reliability is crucial for me in my blog and my line of work. I always tell my clients that they need to be 100% honest with me otherwise there will come a point where I can't help them. Ok! So before I go completely off track. Let me introduce Kosmea's Rosehip Oil. I actually learned a few very important bits of information by using this product for the past 4 weeks. HOW CAN KOSMEA ROSEHIP OIL HELP? WHAT'S DIFFERENT ABOUT KOSMEA'S ROSEHIP OIL? When I first received this product, I thought to myself, how is this Rosehip oil different to all the other brands I have ever tried? After reading through Kosmea's fact sheets, I was blown away! Kosmea uses the entire Rosehip to extract the oil, the fruit, skin, seed and all for maximum vitamin content. Heat and chemicals are not used during oil extraction. Due to the holistic use of the entire fruit and extraction method, Kosmea's Rose hip oil contains more Vitamin A than a lot of my favourite Australian and New Zealand brands!! Rosehips are ethically sourced from Lesotho, South Africa. The crops are 100% USDA certified organic wild crops. Before we go into the product performance. I just wanted to point out that doing your research on a brand and product is ridiculously important before purchasing. I was not very familiar with Kosmea but once I sat down with a cup of tea and learned more about the company, I was partially sold. Their philosophy resonates with me; sustainability, holism and environmental wellness. IMPORTANT: Before I received this Rosehip oil, I have actually stopped including oils in my routine mainly because the oils didn't sit on my face quite right, doesn't get absorbed properly and difficult to spread. Have we all been using Rosehip Oils INCORRECTLY?! I have always applied Rosehip oil onto dry face. According to Kosmea in order to achieve best results, skin must be damp. Well that explains it all!! Because when applied on damp skin, the oil spread with ease. I have been using this product day and night for the past 4 weeks, during day time, I mix 2 drops of rosehip oil with my foundation to help out my winter skin, it works wonders. During the evening, I have been using 3 drops of Kosmea Rosehip oil all over my dampened face with the residual applied on my neck. I have been using an alcohol free, spray on toner to dampen my face. I found that when my skin is hard and peeling, the rosehip oil is not enough and I need additional, heavy duty products. This happens on and around my nose every winter. I did have to use Vaseline on my nose to rid and to break down the extra hard and dry skin for a couple of days. One side of my face has been flaky ever since the cool weather arrived, Kosmea's Rosehip oil really did help keep the flakiness at bay! (see pictures below. There has been evenings where my skin felt so great and I didn't need to apply any additional night cream. My skin feels beautifully soft following the use of Kosmea's Rosehip Oil and I feel that I can see some difference in the overall quality of my skin now that I am actually applying Rosehip oil correctly. Due to my break outs a couple of months ago, my skin was bearing a small amount of scarring, although my scars do eventually fade, I feel that the process was sped up a little bit while using Kosmea's Rosehip Oil. Since they are small dark freckle like scars (and I have a LOT of freckles) the healing process is usually slower for me and less noticable until the scars are no longer visible. I feel that I need to continue to use this product in order to determine the long term effect and whether it will rid my acne scarring/even out my skintone in the long run. 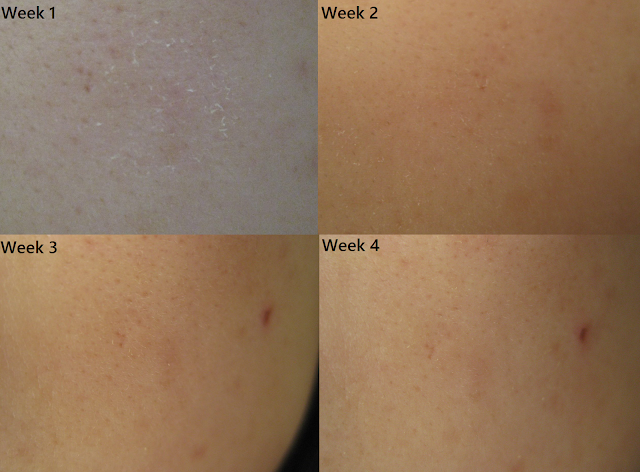 I was quite happy with the way the oil worked, as I feel that I noticed a difference to my skin, especially to the flakiness, I tried to document my progress in photos below, the first picture was taken in a different light, the rest are a little bit more consistent! Now that I know Kosmea's Rosehip Oil has up to 8 times more Vitamin A than other rosehip oils in stores, I think I know what I will pick off the shelf next time I'm shopping for a rosehip oil. Before I wrap this post up, just want to mention another point I've learned while using and researching Kosmea Rosehip Oil. You can still use a serum under rosehip oils, just ensure it is water based. That makes sense right? Oil sits on water but not the other way round. Disclaimer: This is a sponsored post. Lily not Louise received payment for this post, product was provided for consideration, however as always all opinions are my own. My first Sephora Showcase!! I am so ridiculously excited to share this post with you guys because there are so many wonderful products launching in Sephora. Sustainable, eco friendly and chemical free products are on the rise - which is excellent! A Korean makeup brand created by fashion blogger StyleNanda. BEAUTIFUL new illuminators to watch out for! Launching 7th of October. Givenchy to hit Sephora Australia, the "grey" lipstick is a custom shade and will accentuate your lip colour. New Air Blushes from Marc Jacobs and a Holiday collection to keep an eye out for! Launching 11 July (YES THAT'S MONDAY!!!!) Time to check your internet speed and make sure your mouse is working smoothly. A Korean skincare brand with a cult following, why? Because their primary focus is to fix your pores. So many new goodies from Zoeva, a holiday trio palette, matte lippies, strobe creams (Make sure you dip your fingers in the strobe creams, you'll be pleasantly surprised. One of the brands that caught my attention the most. Edible beauty is an Australia brand using a lot of Australian ingredients. Their face oil is the most stunning product I've ever put on the back of my hand. Their products is not for eating, but there's not a single ingredient in the skincare that you cannot eat. A line created by Celebrity Hairstylist Jen Atkin. See Jen in Lisa Eldridge's latest YouTube Video! Gorgeous smelling fragrances for men and women! Launching their mascara and brow product! For all the babes who are into whitening, this is for you. New Tarte products launching at the end of this month! Sephora welcoming Lara Bingle's products! Holy Moly, 22 new concealer shades by Kat Von D. There's even a white shade. A lovely sleeping mask and products made with nutrient rich algae! A full nail prep system! Another brand to keep an eye out for. We have make up and skincare without all the nasties. Now we have a fragrance line without any nasties. This brand believes in sustainability and so do I. Their packaging is biodegradable. I love beauty brands who do their bit for the environment. Another beautiful skincare brand with an Apricot oil that smelt freaking amazing! No artificial fragrances in the oil either. So good I wanted to eat it. Some beautiful Vitamin C boosters and holiday packs to look out for! And of course, there's no shortage of food! There was a couple of stalls that I missed (or visited and missed photos with), including Caudalie, Patricks, Alterna, Percy and Reed, Makeup Eraser, LQD and For Beloved One. I am meeting with For Beloved One next week to learn more about their products :)A massive thanks to Sephora and One Daydream for having me!